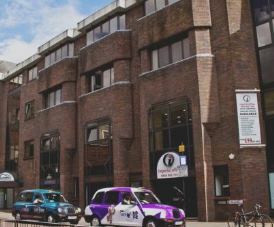 Eastern Road Business Centre is situated in Romford and is well placed for the town centre. The local area has good amenities close by including cafes, bars, restaurants, and shops. With train and tube access to London, these offices for rent come complete with telephony and internet connectivity. Workstations for the suites are also supplied along with digital phone handsets with answer machines build in. The interior of the building has been interior designed to a high standard and boasts a stunning reception which is ideal for when clients visit. Large meeting rooms are available to use on-site and can be used for general company discussions or even training sessions. Equipment such as projectors, audio and visual is also in place in the boardrooms.